Welcome to the first Project 52 of this 2019. Yes, I’ve decided to keep going. It’s nice to choose a photo of the week, and to have a look back on what we’ve done for the week. Like last year I’ve opted for a Project 52, rather than 365, so I’m now in year 5, I think, of joining in. On Sunday it was a lazy day. No plans so just a quick nip to the supermarket in the morning and back home for lego building, watching films and doing jigsaw puzzles. Monday was the start of our busy second week of the Christmas holidays. N and I went over to a friend’s house – I’m friends with the mum of one of the boys in his class. We spent the day chatting an the boys spent most of the time out on their bikes and then building dens for nerf wars. Afterwards, N had an hour’s nap to make sure he was ready for the new year’s eve party we went to. It was a lovely party, and so nice to see all the children mucking in together as usual. New year’s day I’d planned to be a quiet day at home. But the OH was obviously a little tired (hungover) from the night before, so hogged the living room from 9.30. Instead we headed out to soft play. There was one bonus, we ate out at lunch, and because the OH was still asleep and didn’t want a proper meal, we just had cheese on toast for tea. The back room was freezing cold despite the heating being on, so when N went to bed, I headed up as well, with my laptop so blogged for a while in bed before getting an early night. Wednesday was a day out again, catching up with another friend. One of N’s old nursery friends and his mum. We hadn’t seen them for 18 months+ so it was lovely to get out with them. The boys got on really well again – we visited All Things Wild and they loved the play equipment, soft play and the go karts especially. Thursday we headed out with Mary and Monkey from Over 40 and a mum to one to Clivden. It’s a National Trust gardens we’ve not been to before and I can imagine how beautiful it is when the sun is shining and the flowers are all out. We had a lovely day, and again it was nice to catch up. Friday was chance to not do much. That was the theory, but at last Nativity Rocks was on at our local cinema for 3 days/showings only. We’d been waiting since we saw the trailers in October, so had to go and see it. It was another (cheap) kids club showing, and for the first time in ages, the cinema was quite busy. N also got through the trailers and the whole film without asking how much longer there was. Proof he really enjoyed it. Saturday was a jobs day. Time to do everything I’ve not had chance to – taking back unwanted sales purchases, getting the OH’s birthday present, food shopping. I made ‘tandoori’ chicken for tea but couldn’t find tandoori paste in the shops so had to improvise with balti paste. N was pleased with tea eating it with rice, the OH didn’t moan (which is a result) although he ate his with potatoes. Hopefully that means we can have it in future as well. We had pancakes for pudding. Like most people we usually only eat them for pancake day, but they were delicious. This week’s photo was one taken at Cliveden down by the Thames. I took the photo for the relections, but on upload I see a split colour tree and at least 2 faces. Happy New Year! Sounds like a good start to the year. Oh my kids love the Nativity films…find them hilarious! That tree looks pretty cool! Happy New Year, sounds like a busy start to the year, I love that N had a nap to prepare for New Years Eve, unfortunately mine have never been early to bed and have managed every New Years Eve until midnight without any help! Love the photo you have chosen for the week, I too can see the faces. Happy New Year to you all, I can’t comprehend being that cold although I do find it a bit fresh at 16c here in the mornings. Hope you enjoyed Nativity Rocks, i stumbled across it being filmed in Coventry about 18 months ago. Lovely to meet up with Mary. a busy full on week for you by the sound of it. Shame hubby had a hangover and you felt chased out of the house. That tree looks like something from a film, I can almost see a face on it and expected it to walk and wave its arms. What a busy week, so much crammed in, lots of playdates and days out. Eddie wanted to see Nativity Rocks, but I didn’t like the previous two films, and just couldn’t force myself to see another one. I’ll get it for him when it comes out on a DVD. 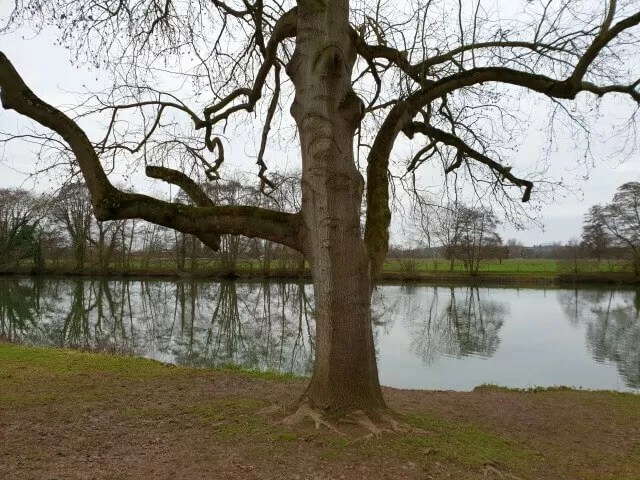 I can see faces on the tree as well. A beautiful shot. It sounds like you had a lovely, busy week. N must have loved staying up for the new year. The colours in that tree are incredible, it’s like someone has drawn a light round down it. It sounds like you’ve had some fab days out. I have really been wanting to see Nativity Rocks. I will get around to it eventually. lol I’m glad the balti chicken went down well.